Sweden's Bloodbound returns with a new stable lineup (hopefully), a new record deal with AFM, and a new album Unholy Cross. Finally finding their groove with 2009's Tabula Rasa, Bloodbound once more delivers a sound and invigorating platter of melodic heavy/ power metal. To that latter statement, while most would call it derivative, Bloodbound has become expert interpreters of the genre. They deliver heavy metal with big melodic hooks on Drop the Bomb and The Ones We Left Behind. Then they can blister and pummel with the charging power metal of In For the Kill or Message from Hell. Other songs steer a middle course taking attributes from both like the closer and title cut, Unholy Cross. Bloodbound also shows their aptitude for a pure heavy metal anthem on Brothers of War. Kudos to current singer Patrik Johansson (Dawn of Silence) for a solid and versatile performance; he shows real passion for the material. Overall, this is Bloodbound hitting the heavy metal groove. Though like many in the same field, they can sound a bit to familiar: In the Dead of Night sounds like Edguy circa the 'Mandrake' era. Yet I'm sure their critics will find even more similarities. 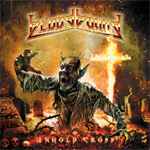 With Unholy Cross (and a stable lineup), Bloodbound is revived once more to deliver their entertaining version of melodic heavy and power metal.